Green and white plants provide a beautiful backdrop to colourful outdoor furniture and decor pieces. 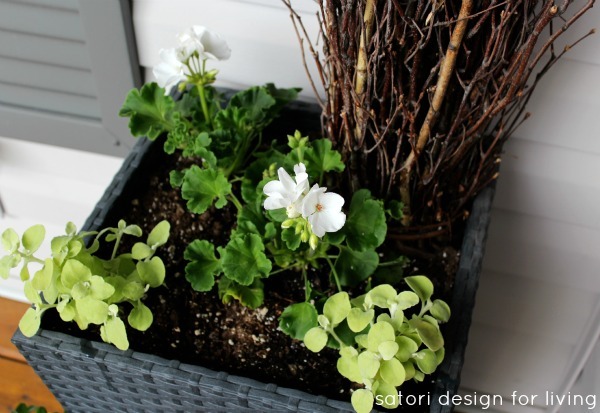 You may have noticed that I decided to go with simple green and white plants in our pots and planters this spring. In previous years, I’ve tried everything from yellow dahlias to purple mums, and even some black petunias. But this time, I wanted the plants to serve as a backdrop to the colourful furniture and decor pieces I recently added to our outdoor spaces. 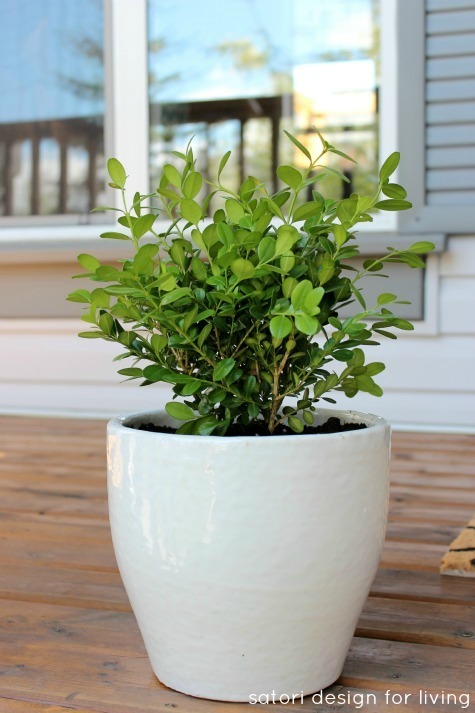 Boxwoods are a fairly new plant in my gardening experience, and thanks to Pam from Simple Details, I didn’t have to plant mine twice. Potting them a little deeper means you won’t see the stem as much, and it’s easier to get the round look that’s so desirable with boxwoods. Mine have to fill in a little more before I can shape them the way I’d like. For the large planter on our front porch, I kept the branches from last fall and added white geraniums and trailing limelight. They really could use some sunlight in the midst of all the rain to start filling in, but once they do I know they’ll be gorgeous. 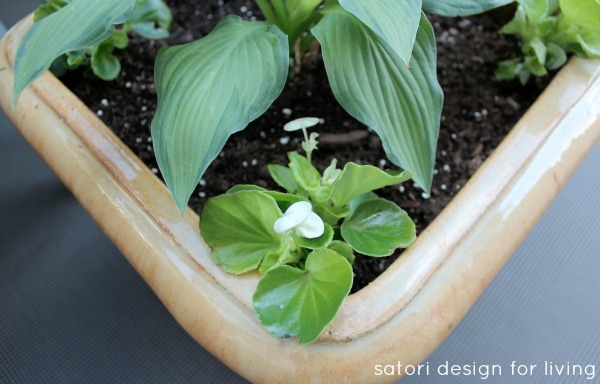 Potted white begonias prefer the shade and can be moved out of the extreme heat if necessary. 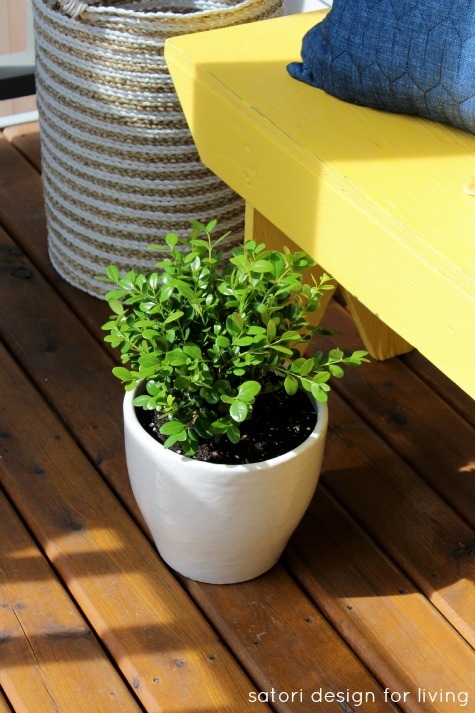 Small pots are easy to switch from one space to another, and this one may need to be moved from our front porch to the back deck once the weather turns hot. 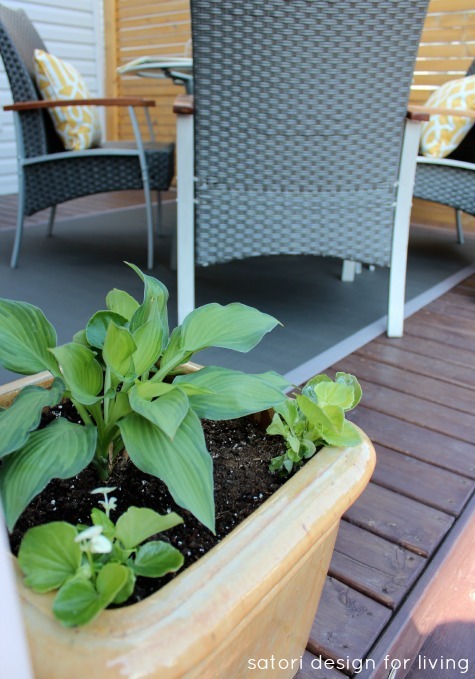 On our back deck, I planted shade-loving hostas and more begonias. I love the contrast of the green and white plants against the yellow pots. For the table centerpiece, I did venture out with some burgundy and blue coloured succulents mixed in with the green, but they’re still very simple. Once the rain stops, I plan on potting some larger boxwoods for our lower deck and stone patio. I think they will add some visual presence and provide a touch of texture. Did you change up the colour scheme for your plants and flowers this year? What are some of your favourite varieties for keeping it simple? Completed an Outdoor Paint Project? Be sure to link it up at the Outdoor Extravaganza party that’s going on all week. We’d love to see you there! 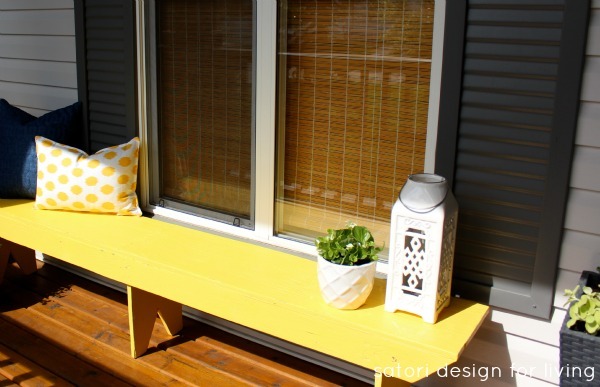 The yellow bench looks adorable! This looks simple and beautiful. I great combination in my book. I have got to add some succulents somewhere. I’m still so behind in my container gardening projects.. 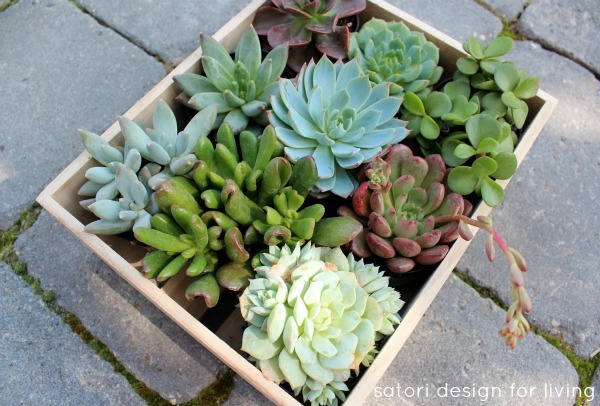 I love the simple colors and remember they go dormant in the winter, and wake up again in the spring bigger and better! It’s tricky sometime to get the right colour combination for your planters. Love the green and white! I love the fresh look you have created, and your idea to use your plants as a backdrop is brilliant! I have a hunch you’re really going to enjoy your outdoors this summer. Nice work, Shauna!! !